Most parks have more publishing needs than they can satisfy. Often money and time are not available for professionally-prepared publications and routine announcements on day-to-day matters important to visitors. In the interest of effective management, however, park staffs want to provide information in orderly, responsive ways. 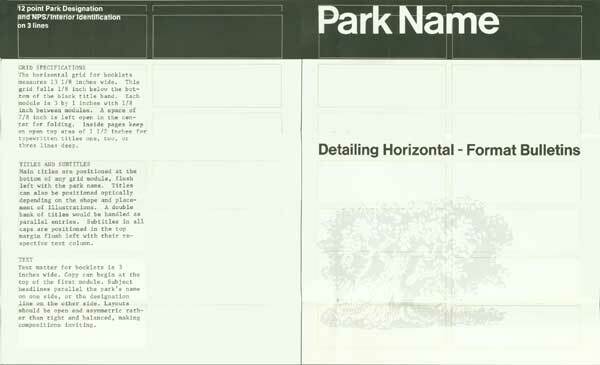 The graphics system outlined here is intended to help park managers produce supplementary publications with their own staff. Instructions for producing these items are presented in three parts: the top sections explain the theory behind the system; the middle sections tell how to translate these rules into practice; and the bottom sections detail the steps in a publications project, utilizing the system's low-cost methods. We call these park-produced materials Site Bulletins, largely because they are intended for urgent or interim needs, but also because they Site Bulletins have an immediate, bulletin-like look. The principles of the system are simple, easy to apply, and consistent with the official National Park Service interpretive publications program. The system's graphic components include standard formats, grid-based layouts, typewriter composition, and reproduction by office copier. Content is topical and changeable information: temporary park folders, trail guides, schedules, and other information essential to park operations. Generally, park information problems require practical solutions at a low cost. This system recognizes these conditions by offering formats and methods that bring predictable results with full regard for the diversity of the subject matter and those working on the projects. The intent is to give participants a clear view of what is wanted so that all parties will have a better understanding of assignments. Site Bulletins can be produced in two formats. 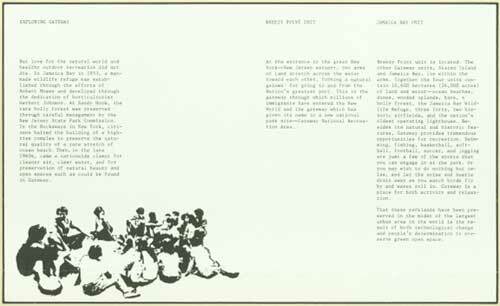 Below is a plan for 8½ by 14 inch vertical-format bulletins, which are well-suited for interpretive literature, guides, mailers, and posters. On the other side is a plan for producing horizontal-format bulletins, using the same 8½ by 14 inch sheet. Folded and stapled, these become self-guiding tour booklets, interpretive essays, catalogs, and periodicals. These two formats with their respective grids are the backbone of the system. They permit standard specifications and bring uniformity to the presentations. And they help the beginner organize the components. Our commitment is to solve like problems in like ways. Information is therefore fitted to the format much as it would be in a newspaper where a new format every day would be unmanageable. With format and methods suitably resolved, there is no need to redesign basic components for every new job, and park staffs are free to concentrate on subject matter. The system's structural concept provides a fixed basis for organizing and subdividing information. While the Site Bulletin system relies on quick methods and inexpensive materials, it is a fully rounded concept, functional in form, and based on established graphic principles and sound economic ideas. Park personnel should become acquainted with the principles of this system before putting the plan into practice. After a few dry runs, the park staff should be able to produce materials as required. Besides helping a single park, the system offers another advantage. In time the traveling public will become familiar with the graphic language of the National Park Service, and therefore communication will be easier and the organization's identity will be strengthened. The inexpensive graphics of the Site Bulletin system were developed by consulting designer Massimo Vignelli as part of a study sponsored by Harpers Ferry Center and Gateway National Recreation Area, New York. The aim of this pilot project was to find practical approaches for communication needs common to most national park sites. While these simplified methods will not meet every requirement, they provide a solid base from which to begin most assignments. VERTICAL-FORMAT BULLETINS are small flyer-type publications suited for interim park folders and related applications where the broadside is applicable. Materials in this format are organized in a pre-determined framework for 8½ by 14 inch sheets, or with suitable alterations, reduced to the size of a wallet card or enlarged to the size of a window display. This approach is both flexible and economical. 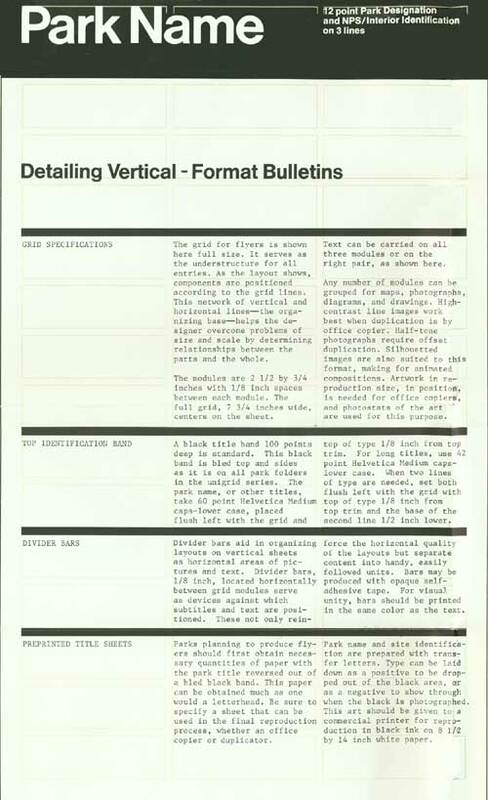 GENERAL ORGANIZATION Content for vertical-format bulletins is laid out in keeping with the fully opened sheet, and materials are organized horizontally. Text matter and illustrations are positioned in columns determined by the grid, but broken down into information bands that run across the sheet. This simple horizontal structuring of text and pictures should help the beginner arrive at a professional design with a minimum of time and effort. Never violate this practice. Three graphic devices help shape content along prescribed horizontal arrangements: the 100 point top identification band; the ⅛ inch divider bars; and the main titles with their emphatic Helvetica Medium typeface. Because the text with the bands is lighter in tone than the black horizontal elements, a sharp division occurs between titles and text entries, a contrast that makes it easy for readers to find and use information. This approach also simplifies the layout process. TEXT Reading matter should be tightly edited and the titles and subtitles should be specific and clear. Type your texts within the grid lines. Rag-right text treatments are preferred to avoid hyphenation problems. The two righthand columns are used in most cases for text, and the lefthand column usually is left open, broken only by horizontal bars and subtitles. Text can be positioned in all three columns, but when that occurs, bars are not used, and either the upper or lower area is reserved for map or illustrations. ILLUSTRATIONS Maps and illustrations often help to convey important information or impressions. Because of the limitations of office copiers, line art and solid silhouetted images are best for Site Bulletins. Pictorial matter should be positioned to achieve an integrated look. Almost always, one dramatic illustration is better than a lot of little ones. Maps with multiple colors and toned images occasionally are necessary, but these require reproduction by commercial printing. In brief, illustrations should be used sparingly to enhance the message and to provide visual relief. WHITE SPACES Beginners often have a tendency to fill all available spaces in layouts. Open areas, however, are part of the concept and should be used to accent content and provide relief. When negative spaces are used skillfully, they keep layouts from becoming rigid, conveying a sense of spontaneous treatment. ADAPTATIONS When the vertical format is used at a scale larger than the basic bulletin format, all elements in the new size must be modified to fit the new scale. A display panel 6 feet high needs optical adjustments far different from those required for a bulletin. As a rule, the larger the size, the less the text, and the more poster-like the treatment. With a little imagination, park managers can use this format to produce such items as cards, announcements, and broadsides. Type, properly specified, is essential to the system's highly structured effects. Clear, logical language supports this, as does the orderly sequencing of information. But it is the contrast between titling and text elements that give layouts their simple directness. So when laying down entries keep in mind that a tautness between elements must be present if bulletins are to function as intended. TYPEWRITER TYPE This system reduces costs by employing a typist instead of a typesetter, and the informal, direct look of this inexpensive approach reiterates the desired bulletin quality. The light, open text produced by the typewriter also complements the scale of the format. A typeface with serifs is preferred to one without, and both Pica and Elite typefaces are excellent choices. COMMERCIAL COMPOSITION Commercial composition can be used in the Site Bulletin formats provided all entries are properly selected and scaled. Such type is far more compact than typewritten material, so it should be smaller. Generally, 8 point Helvetica Regular, 2 points leaded, is best for the measures in this system. The important consideration is to keep an informal, open appearance in the work as opposed to a heavy, dense look. TITLES AND SUBTITLES As stated elsewhere, main titles are in 24 point Helvetica Medium and are used in conjunction with bands and bars an ordering device. These should be kept short, to the point, and few in numberone per spread or less. Main titles can be handled as one-line entries or tiered as shown on the specimens. Subtitles are carried in the text typeface, but all caps. Subtitles, too, should be snappy, instructing the user about the content that follows. IDENTIFICATION BAND The 100 point identification band is used to display the park name and to give Site Bulletins a horizontal emphasis. This band should always be pre-printed because reproduction by office copier gives the bulletin a weak and faded appearance. Print this band in black only with the type reversed in white. Park identification is carried in 60 point Helvetica Medium, caps-lower case. As the strongest, single feature in the system, this band should always be used uniformly as specified in these instructions. MEASUREMENTS Graphic designers customarily use three kinds of measurements: inches, picas, and points. While most dimensions for these bulletins are given in inches, commercial type and the top identification band are indicated in points. As a general reference 1 inch = 6 picas = 72 points, approximately. A printer's rule is indispensable when dealing with these measurements. How does the park superintendent handle a publication project without getting lost in details? While staff capacities at sites vary, and no single approach meets every need, a few constants are worth noting. One is that projects take time and energyalmost always more than expected. Another is that projects take their vitality from the top, and succeed in proportion to management's interest. But the most important constant relates to policy. Because publications support interpretation, resource protection, safety, public relations, and other important operations, projects go smoother when policies are clear to those doing the work, a condition reflected in the end product. The superintendent should thus be involved enough in a project to direct its overall strategy. Often interest and a few questions are all that's needed. For example, the project's purpose itself should be examined to determine whether the proposed solution is appropriate to the problem. The superintendent should also weigh the capacity of the staff to handle assignments in the time available. If the work is to be done at the park, what is the cost? Could someone else do the work cheaper, faster, or better? ONE: CONCEPT A project begins with a discussion of purpose and approach. What is the reason for the publication? Who is it for? What is the budget? What are the main ideas to be conveyed? When these and like questions are answered, the planner should outline the scope of work stating what must be done, by whom, and when. A schedule should now be drawn up, anticipating as many variables as possible and allowing time for each phase as well as some delays. TWO: COMPREHENSIVE DUMMY A dummy layout of the proposed bulletin is a sound investment. This mock-up organizes the many parts into a whole, suggesting its final appearance. This can be a thumbnail or rough pencil dummy of the job, or it can be a "clip" dummy usually prepared at full size with like materials clipped from magazines and made to look like the wanted item. Titles, text, maps, and illustrations should be properly located within the composition. All parties must agree on the dummy's general correctness before the job can proceed. While changes will undoubtedly occur as the job progresses, the park staff should strive to achieve the purposes of the initial assignment. The dummy is a mechanism for refining the whole. THREE: COPY PREPARATION Collecting, organizing, and producing at materials for public presentation come easiest when the purpose is clear and adequate information exists. Before writing the text for a Site Bulletin, it is a good idea to outline the content for each section as well as the entire unit. This takes work, but the more time spent on the basic structure, the easier writing will be. Write the text with someone specific in mind, say a neighbor or an aunt. It is better to receive criticism before rather than after the bulletin is printed. Therefore let others review your drafts and be prepared to rewrite as often as necessary. Because your colleagues may not see the subject as a layman would, consider showing the text to a number of people with a variety of interests. Text matter is prepared on an Elite or Pica typewriter. For a sharp, dark impression, do this on a machine with a carbon ribbon. What matters most are scale and density in the copy. The Elite typeface offers a finer, more graceful massing of words than Pica. Word count is critical and correct entries may take several tries so that word breaks, hyphenation, and paragraphs fall properly. First, rule off a piece of paper, marking the limits of the text spaces. Type copy to fit this space. When perfected, retype the copy on white bond. Trim this to its approximate size for positioning on the mechanicals. A clear-film template imprinted with the grid for the desired format is a practical aid. This acetate grid is used for fitting purposes in combination with a light table, where it can be positioned over or under the sheet being worked on. Harpers Ferry Center can advise on sources where acetates can be purchased. Layouts for this system are open, asymmetric, and animated. From this approach comes the appearance that things have just fallen into place. But far from it. This casual look results from a studied handling of text, illustrations, and white spaces. What at first appears to be random arrangements are actually layouts in which parts are in measured equilibriuman optical effect that is the key to the system's crisp, lively layouts. When first attempting layouts of this type, you may find such combinations elusive and hard to achieve. As a rule of thumb, keep text, illustrations, and white spaces about evenly divided, a third for each. Handled this way, layouts take on a classic simplicity. The grid is the principal means for controlling layouts. Anyone putting this system into practice must be conversant with its use. Slightly different versions have been developed for the vertical and horizontal formats. Each carries overall measurements for the sheet, modules for the text columns, and detailing for the identification band. The grid provides the unseen, supporting structure for layouts, and the means for organizing the many parts. It is shown in white on each of the large models, demonstrating how components are detailed and located within a format. For the system to work, use the specific grid shown. Once the concept for a layout has been determined, a skilled typist can produce text on typewriter paper to fit appropriate spaces in the layout. Text is always placed in the columns of the grid. A column may be left open, or a text column may vary in length, but location is never in doubt. Illustrations are placed more freely. A picture can be positioned within a text column, over two or more columns, or over the entire sheet. Ultimately, however, the white spaces form the background and hold the layout together. By thus reducing text and layout problems to quick, workable methods, the grid opens the way for expressing the ideas and purposes of the publication: what is said and how it is presented. The focus is on solving problems. The challenge in layout work is to translate abstractions into visual forms that anyone can understand, a process that shapes the publication's vitality. On the one hand, layouts need a sense of order and uniformity. But on the other, they need spontaneity and diversity to sustain audience appeal. All elements must work to resolve these opposites, and keep information alive. But it is imaginative variations with words and pictures that create interest in the cause of the publication. So by striving for unity with varietythe essentials of good designpark staffs can produce professional-looking publications. The principles outlined here are necessarily generalized. The HFC publications staff will answer questions about the program, but superintendents may wish to ask a designer to explain the plan in terms of specific needs. What is baffling to the layman may be nothing more than a routine assignment for a consulting designer. Printed versions of the two grids are available from Harpers Ferry Center, and these can be duplicated on an office copier for making trial layouts, or for preparing mechanicals. 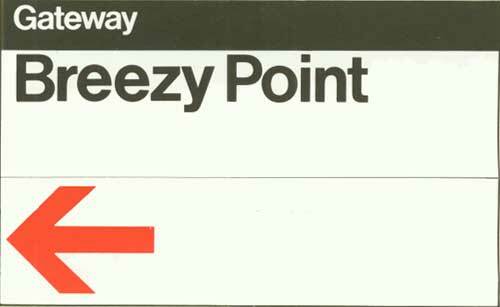 "The grid is a tool," says Massimo Vignelli, developer of this bulletin concept. "When the project is completely designed, there is a sense of recurrence, of unity throughout. There is a sense that the publication has been designed rather than piled up; it has been woven together rather than just put together." 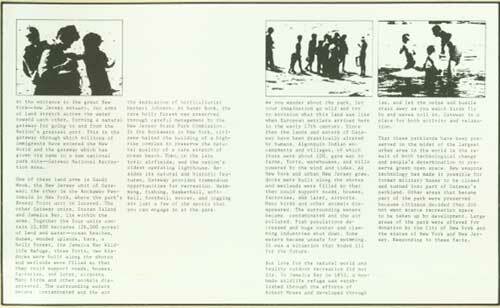 HORIZONTAL-FORMAT BULLETINS are small, inexpensive booklets suitable for localized information, or continuous-narrative topics such as history and natural history study reports. This format works best when content is brief and straightforward. Booklets should range from 8 to 32 pages. Beyond that, leaves begin to shingle and booklets lose their trimness. Stapling the booklets along the fold line adds to their compactness and neatness. Duplicator paper is standard, but a better grade can be specified for offset printing. Black ink on white paper offers the best printing combination. GENERAL ORGANIZATION In booklet work, design follows content closely. Park staffs should create layouts as two-page spreads in sequence, like magazines, aiming for flow and continuity. A margin 1½ inches deep at the top of each spread reinforces the horizontal thrust of the layouts. Uniformity in the text and picture treatments also supports a feeling of movement from spread to spread. TEXT The primary concern when preparing text matter is order and readability. The grid quickly indicates where text is positioned. Each spread provides for four text columns in many variations. To start, draw an imaginary line across the spread 1½ inches from the top running along the upper edge of the column modules. This base line will help you organize layouts. Main titles and most text entries begin here with the top of the capital letters butting this line. Subtitles only are positioned in the top margin. Blocks of text are positioned in columns designated by the grid, hanging from this line like laundry. Keep the length of text columns uneven to produce open layouts. A story can be carried in one column, over several columns, or through the entire booklet. ILLUSTRATIONS Pictures are used largely to explain text matter, but these must be balanced between too little and too much. If images are sparse, the booklet runs the risk of being plain and unappealing. If they are too plentiful, layouts appear crowded and unordered. So be alert to ways to support the presentations with drawings, diagrams, and photographs. Use these elements at points determined by content or, subjectively, to aid in the flow of ideas. 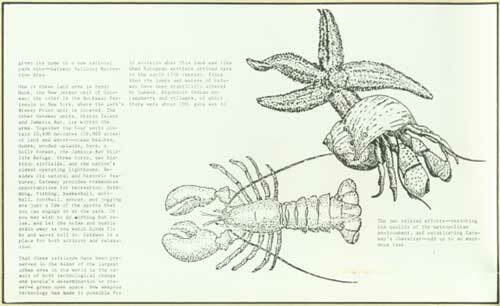 As the specimens indicate silhouetted and line-work images adapt best to the open layouts. WHITE SPACES The high-key, or white, overtones that characterize this format derive from wide top margins, open bottom margins, and an occasionally empty text column. This white quality is an essential part of the concept, and is used to give unity and variety to the the spreads. Content comes first, but it is through dynamic positive and negative visual effects that information takes on added meaning. The graphics concept for bulletins can be utilized for temporary identification, directions, and announcements in offices, on buildings, or in larger form, along walkways or roads. The plan is basic and direct. When preparing signs in this system, take the standard 5½ by 14 inch horizontal grid using 120 point Helvetica Medium, caps-lower case, for the display text. All signs have a 100 point black top band with the standard type treatment for the park's name flush left to the full grid. The message field is always white and is divided by a black rule to organize entries. Words are produced by means of transfer type on the master. Arrows must be hand drafted and should appear in color. It is best to keep information limited to the name of the building, the service described, or the time and place of an event. Larger signs are achieved by projecting the basic form. Use screen processing for multiple signs with the same message. Base materials for sign adaptations can be board, cardboard, plastic, or metal. Type is used boldly. Paper signs are laminated in plastic for water resistance. Once text and illustrations are organized to the dummy layout, the cutting and fitting tasks leading to duplication begin. This phase is full of variables, so it is important to keep the project moving toward the concept envisioned in the dummy. The park staff must accordingly view the job in its entirety, making additions and deletions in keeping with the wanted end product. As this is a time for decisions, the superintendent should review developments at critical points. ONE: MECHANICAL ART The master layout consists of one or more pieces of heavy paper, about the thickness of ordinary file cards, which make up the base on which the publication's many partstype, maps, and illustrationsare assembled. Now called mechanicals at this working stage, these layout sheets are cut slightly larger than the bulletin itself. The outside edges and grid modules are marked with a light blue, nonreproducible pen or pencil. Type, maps, and illustrations must be positioned accurately on these mechanicals. Entries on the models show where to place elements. Among the tools needed are a drawing board, T-square, razor blades, rubber cement, and a small light table for layout purposes. The mechanical is the publication in its first version. It must therefore be precise and complete. Type is always used at the size it will appear. Other entries are handled according to the printing method used. If reproduction is by office copier, all parts must be positioned on the mechanical at their actual size. Maps in simple linework and exact size should be treated as photostat art. Illustrations are photographically reduced or enlarged to the required size and positioned. If reproduction is by printing press, maps and illustrations can be submitted to the printer as separate elements but they must be keyed by number to their proper location. The printer will reduce or enlarge these illustrations when making films for the printing plates. When two or more colors are specified clearly mark those areas for the printer. Display elements such as bands, bars, and rules, are applied to the mechanical in ink, opaque self-adhesive film, tape, or black paper. Large type entries are positioned in their exact size. For good looking results, be neat and precise when preparing mechanical art. TWO: REPRODUCTION At this step, the park must make a basic choice. What will be needed in quality and quantity when the final product is available? Reproduction by office copier, while fast, and inexpensive, has the disadvantage of a somewhat cheap look that conveys a lack of concern. Commercial printing, though more costly, makes for richer, sharper impressions. A printed publication usually has greater visual appeal and its message is more likely to be retained. But whatever the medium, keep your materials simple. Stick to black and white. Avoid arty effects. If you have something important to say, your effort will invariably be successful. The first step in reproduction by office copier is to acquire a supply of 8½ by 14 inch sheets preprinted with the black identification band carrying the park name. You must obtain these preprinted sheets from a commercial printer because copiers cannot reproduce the bleeds and solid blacks called for. Use white commercial paper and black ink for this purpose. When you have this stock, and the mechanicals, you are ready to run off copies of your bulletin. Reproduction by commercial printing increases the opportunities for variety when this is important. While black is mandatory for the top band, and this ink run can also be used to print the text, color can be specified for a second run on the press. When this occurs, the extra color prints the full area beyond the band with all entries, including the bars, printing in the second color. Four inks are preferredwarm red, process blue, mid-green, and mid-brown. When complicated maps, diagrams, or illustrations are wanted commercial printing permits multiple-level film combinations and the richest effects. In such cases, materials should be prepared by a commercial studio, and the park should discuss its plans with a qualified printer. THREE: DISTRIBUTION Unless you face some unusual situation, distribution will be your simplest task. Most items will be handed out to visitors and sometimes mailed. Vertical-format bulletins can be posted on announcement boards or put in store windows. Horizontal-format bulletins are useful on counter-top displays or as give-aways for pre-visit school kits. Whenever large numbers of bulletins are mailed, they should be folded by machines. If the bulletins are to be distributed as self-mailers, reserve space for the sender's address, stamp, and mailing label.